The holiday season offers a great respite from studies for DePaul students. The nearly six-week break is relaxing to many, but a lot of students struggle to find activities to occupy their time if they aren’t heading home for the holidays. The dilemma is worse for students who are spending their first winter in the Windy City. “I’m excited for break because I haven’t had the time to explore more of the non-touristey places in Chicago,” said Peyton Suzuki, a freshman from Los Angeles. “I’m aiming to do just that over break, while bundled up from head to toe, of course. “Winter break was the first time I got to explore the city on my own terms,” said graduate student Sanjna Malik. “I made a list of all the places I wanted to visit, but didn’t get a chance to when I was drowning in homework. Like Malik, The DePaulia made our own ultimate bucket list of quintessentially Chicago activities you can take advantage of over break. 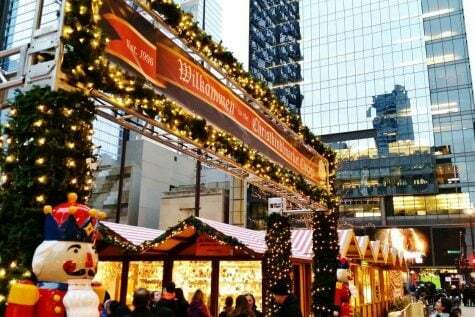 Based off of the original 16th century Christmas market in Nuremberg, Germany, Christkindlmarket, the largest annual open-air Christmas market in Daley Plaza, draws inspiration from winter festivals in Germany. Vendors are tucked into cozy village-style huts and sell food, ornaments, clothes and other handmade items. Patrons particularly enjoy sipping Glühwein (roughly translated as “glowing wine”) or hot chocolate from the event’s signature mugs. Going along with this year’s theme of “I love Christkindlmarket,” the mugs this year are designed in a heart-shape. Don’t forget to get your fill of the famous sauerkraut and potato pancakes, as well. This year’s event will run from November 16 to December 24. Making your way to this holiday staple from school is hassle-free as the market is only a short distance away from the Lake Red Line stop. ZooLights at the Lincoln Park Zoo is a holiday tradition 24 years in the making. This free, family friendly hosts fun activities such as ice sculptors, fun rides, sweet treats, carolers and even visits from Santa Claus. Enjoy the glow of 2.5 million lights when ZooLights returns on Friday, Nov. 23rd. 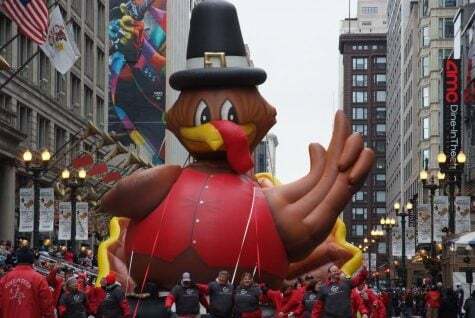 The 2018 Chicago Thanksgiving Parade, which attracts approximately draws 1 million spectators each year, takes place on Thanksgiving Day from 8 – 11 a.m. The parade takes place in downtown on State Street and will run from Congress Parkway to Randolph Street. Expect to see incredible dance and band performances, equestrians, massive floats, giant cartoon balloons and even celebrity appearances. If you can’t make it in person, you can still catch the live broadcast on WGN 9 Chicago. 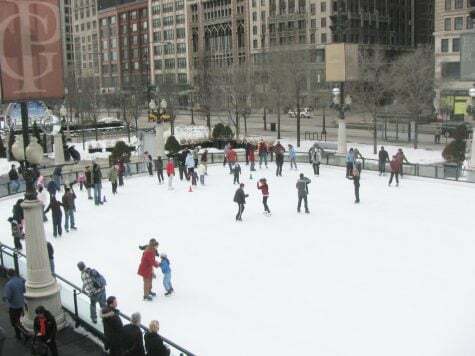 Skate against the backdrop of the Chicago skyline at the McCormick Tribune Ice Rink in Millennium Park. Admission is free and you can rent skates for under $20. Never fear if you do not know how to skate because free ice skating lessons are offered on Fridays at 11 a.m. and Saturdays and Sunday at 9 a.m. The rink is open from Friday, November 16 to Sunday, March 10, 2019, weather permitting. The Bean, or more formally know as “Cloud Gate” is a gleaming public sculpture by Indian-born British artist Anish Kapoor that sits in Millennium Park. The popular attraction bends the Chicago skyline around its mirrored surface. This showpiece has quickly catapulted to the top of Chicago attractions, dethroning Navy pier as the biggest tourist attraction in the Midwest. 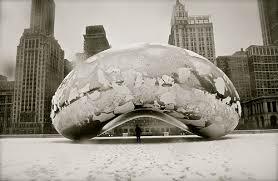 Although magnificent year-round, the Bean is particularly breath-taking in the winter, its svelte figure lightly dusted with a crisp, smattering of snow. Root for our hometown teams as they compete all winter long. Make it a point to enjoy a Bears, Bulls, Blackhawks or Wolves game (or all of them) if you’re in need for a rush of adrenaline to combat the plunging temperatures. DePaul men’s basketball plays eight games over break, so check out a game at the Wintrust Arena if you haven’t already. This time travel-themed coffee shop with a big ol’ Delorean parked near the front window is a Wicker Park favorite. This coffee shop is a throwback to the 80s with nods to classics like “Back to the Future,” “Star Wars” and “Ghostbusters” to name a few. To take a trip back in time and enjoy their signature cold brew drinks, drop by this neighborhood staple. The famous “Walnut Room” in Macy’s on State Street was the first ever restaurant to open in a department store. The 17,000 square foot dining room offers shoppers a nice respite from frenzied holiday shopping. Make sure to enjoy classics like Mrs. Hering’s Chicken Pot Pie. 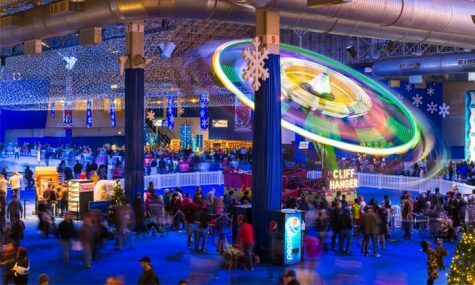 Navy Pier’s annual Winter Wonderfest is 170,000 square feet of fun, wintry-themed attractions such as indoor ice skating, inflatable rides, a giant Christmas tree and festive carousel to name a few. Attractions cater to all ages as there’s something for everyone to enjoy. The event runs from December 2 to Jan. 8, 2019.